A native of Welling Kent, it’s not surprising that Bernard found the Granada theatre opposite his junior school interesting, especially when he could hear the Wurlitzer being played by the then Manager and Granada organist Leo Rae normally during morning break. At the tender age of 11 and already learning to play the organ at his local church one hundred yards from the Granada, Bernard walked into the theatre, leaned over the pit rail and persuaded Leo to take him as a pupil which was eventually funded by his senior school. He performed numerous concerts for the TOC from the age of 17. Around this time and together with David Shepherd he played nightly intermissions at the Odeon Leicester Sq Compton to keep it in public eye, after the unfortunate death of Gerald Shaw who was another of his mentors. Originally trained as an engineer, during the 70’s & 80’s Bernard worked as a demonstrator for several large organ distributors including Technics and Baldwin. Around1986, Casio sounded the death knell for home console organs with their small keyboards and Bernard saw this as a time to change career. He started his own CCTV company to which he is dedicated and continues to expand successfully. At this time he became heavily involved with non-professional theatre as a musical director with over 30 pantomimes and countless musical shows to his credit, an interest he continues to this day. Bernard keeps his hand in playing both as a musical director and occasionally entertaining on Theatre organs. 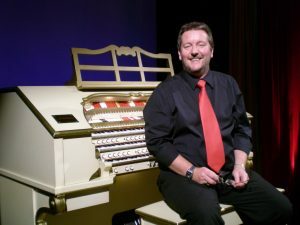 He is the very proud owner of an antique white and gold Allen GW 319, 3/21 digital theatre organ installed in his home. He takes it out for concerts encompassing silent movies presentations to the Bob Hope Theatre Eltham normally to raise money for good causes such as the air ambulance and the COS’s very own Troxy project, in which he is involved as the resident expert tea taster and occasional engineer. Bernard is a dedicated businessman, organist and entertainer he is also a keen yachtsman, Masonic Provincial Grand Organist for West Kent, and dotes on his young granddaughter with whom he shares an interest in astronomy and Lego!